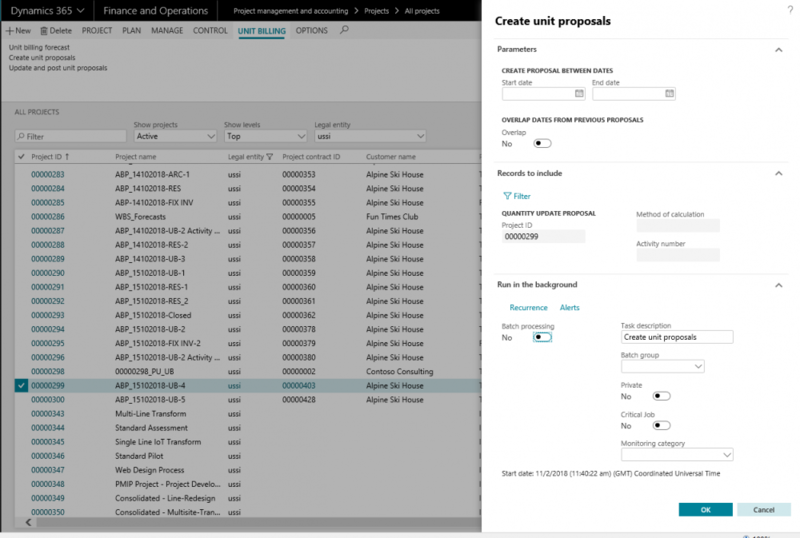 *This section details how unit proposals can be created or updated. 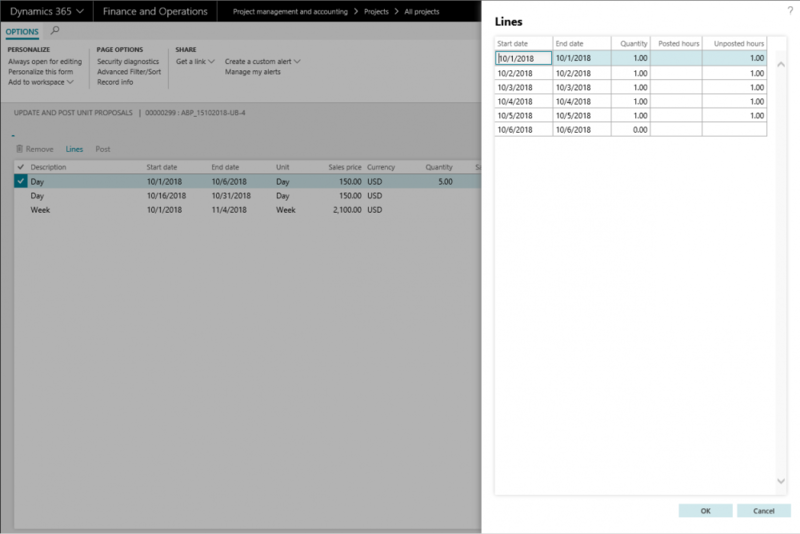 For every unit forecast line there is an item requirement line that is created behind the scenes, which has to be quantity updated for the invoicing to take place. In this feature, the quantity update is generated through a proposal. This proposal generation depends on what is defined in the method of calculation field. For this functionality two new forms are created and is explained in the below sections. In this form the user can create unit proposals. The basis for generation of this proposal is the method of calculation field. The user can choose dates for which the proposal is to be generated. Based on the period selected and the method of calculation, the proposed quantity that can be updated as completed against the forecast line is proposed to the user. The calculation of the proposal is displayed for the user to be able to view and edit the quantity if required. The proposal generated can be viewed in the Update and Post Unit proposals form. Unit forecast line is from 10/01/2018 to 12/31/2018, and the method of calculation is set to “Resource per month”. The create unit proposal is run for the period 10/01/2018 to 12/31/2018, assuming that the resource has entered timesheets for the selected project in all the months, the same will be updated as quantity one per month, thus the quantity 3 will be displayed against this forecast line In the Update and Post unit proposals form. Start date Start date that has to be considered for the unit proposal generation. End Date End date that has to be considered for generating the unit proposal. Overlap This checkbox determines whether the proposal should consider the dates for which the proposal has been previously run. If this option is set to “Yes”, then the proposal will include the dates in which the proposal has been created previously. When this option is set to “No”, only the period for which the proposal has not been created will be considered for the quantity calculation. Filter Project The project from which this update is being run, is defaulted in this field and the user is not allowed to update. Method of calculation Filters the records based on the method of calculation. Activity number Filters the records for the selected activity number/numbers. Run in the background tab Has all the standard options available for running this process in batches. This form displays all the lines that are generated in the proposal from Create unit proposals. The user will be able to edit and display the update quantities. Description Item description is displayed in this field. Start date Start date of the proposal run. End date End date of the proposal run. Unit Displays the unit of measure. Sales price Displays the sales price of the item. Currency Currency of the sales price is displayed in this field. Quantity Quantity that is proposed from the proposal run. The quantity displayed in this field is the sum of the quantity of all the lines. You can view the breakup of this quantity in Lines. Sales amount Sales price * quantity is the sales amount. Posted hours When the method of calculation is Resource…., the posted timesheets that were considered for arriving at the quantity is displayed in this field. Unposted hours When the method of calculation is Resource…., the unposted timesheets that were considered for arriving at the quantity is displayed in this field. Status Displays the status of the proposal, whether the same is posted or not. Remove Removes lines from the proposal that is generated and is not yet posted. Lines Lines displays/opens up a new form – Lines. The details of this form is displayed below. 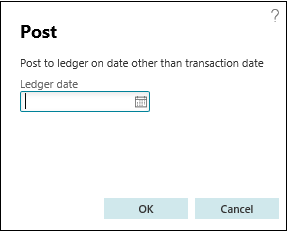 Post This button takes you to the posting form in which the user is allowed to choose the date on which the quantity update is to be posted, in case the user would like to post on a date other than transaction date. On the Lines form users can see the details of the created proposal – the start date, end date, quantity, posted hours and un-posted hours can be seen. Details of each of these fields can be found in the subsequent sections. Start date Start date for which the quantity is being updated. End date End date for which the quantity is being updated. Quantity This is the proposed quantity based on the method of calculation. However this quantity can be manually updated by the user. Posted hour When the method of calculation is set to any Resource related, then the Posted hours for the resources who have booked time on the project, for the proposal period, will be displayed in this field. Unposted hour When the method of calculation is set to any Resource related, then the unposted hours for the resources who have booked time on the project, for the proposal period, will be displayed in this field.